Observations from Malaysia on the world around. Another title for this anime is “He Is an Ultimate Teacher”. In the beginning, the protagonist, Junichirou Kagami appears to be a slacker giving an excuse that he is ill (with a disease called YD - Yearns to Do) which means he cannot do anything unless it is something that he yearns to do. Instead of looking for work, he would just stay at home to play games and update his blog. His sister was not willing to see his wasteful lifestyle helped him get a part-time job as a teacher in a local high school. In the school, he was faced with a few situations which piqued his interest allowing us to see his capability. The first was a girl who had a beautiful voice who wanted to be a voice actor. She was being bullied by three her classmates. He decided to help her because of the value he placed on voice actors (or gods and goddess to him). He was later fired from the job after being accused of being a molester, he took the blame because he wanted to protect a student of the school. After being fired, he was offered a job to teach at Hiiragi Academy. Koyomi Hiiragi (who he called “Options”), the Chairperson of the academy felt that Japan has become boring and wanted Kagami to make it more amusing with his unusual teaching methods. I liked the different lessons he thought, like using a soccer game to teach a school bully the value of teamwork, teaching an uptight student council president (who he nicknamed Uneven Twin Tail) to respect the discipline and valuable lesson that are involved for those working in maid cafes. Throughout the series, Koyomi appears to work in the background to guide Kagami realize his true calling. This include the opportunity to help realize his theory of the “Anywhere Door”. This series shows creative ways of approaching and solving problems. Disclaimer: I was not paid to write this review. I was stuck with nothing to do for three days while I was in the hospital so I decided to watch anime to pass time. 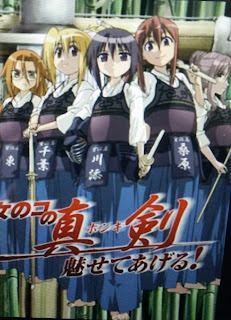 The title is Bamboo Blade focused events within the Kendo club in Muroe High School. At the beginning there was only the coach and one student; everybody had left the club because two of the members (who are no longer active) took pleasure is hurting and bullying new members. The coach who was always broke made a bet the coach (Ishibashi) from Machido High kendo club that if his team (Muroe) is able to defeat Machido’s club, he will get to eat sushi in Ishibashi’s father’s sushi restaurant for a full year. However, there was a problem the match requires five girls in the team. This triggered the search for new members for the club and how the club grew from a nameless club to one that successfully entered the national kendo competition. Most of the credit goes to Tamaki, a first year student who initially did not want to join the club. However, she decided to join the the two bullies challenged her while she was at the club to try out. She felt that the club needed a hero to protect it, just like her hero like her idol Blade Braver, a TV superhero. This is a story of teamwork (with two male students who continue to support other members of the team even though they could not participate in the main competition. It also takes us through the growth (in terms of skills and maturity) of each of the students as well as the coach. Tamaki’s sense of honor also helped her to defeat her opponent even after she was badly hurt through some dirty tricks. Tamaki started out as an invincible player, her weaknesses were later revealed (like the memories of her mother cause her to freeze up when her opponent uses a certain stance, or her lack of social interaction with others). 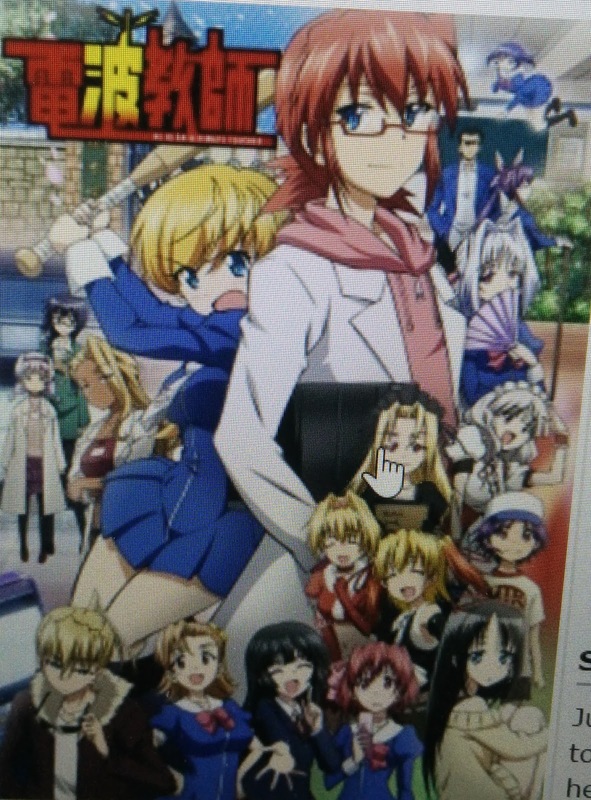 I am glad I chose this anime to occupy my time in the hospital - it was entertaining with a few emotional parts. 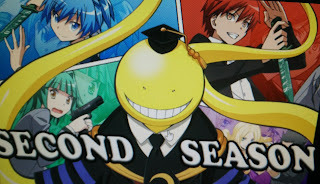 Assassination Classroom (also known as Ansatsu Kyoushitsu) season two continues with the second term for E Class. This anime took me through an emotional roller coaster from joy, fear and sorrow. There was a part when the teacher forced the whole class to help out at a preschool after they accidentally injured the elderly principal instead of studying for their midterm. This provided an opportunity for the students to use the skills they had to do something other than killing and also made them realize that they can do more with the skills they acquired in the past six months. This was followed by the kidnapping of all the students by the assassin known as Reaper. The situation appeared hopeless for the Koro-sensei and his students, especially with the betrayal of one of their own ~ Karasuma (one of the teachers of the class). The rivalry between the top class of the school with E class (the worst class) intensified in the second season especially after E Class managed to defeat A Class in the sport festival’s pole-toppling event despite the fact that A Class having the clear advantage (transfer students who are bigger and stronger, more students). This let to the involvement of Gakuho, the principal of the school. Gakuho’s twisted educational method and his directive to make the end-of-year exams very difficult was not enough to defeat the students of Class E (all of whom achieved the top 50 positions in the school). Gakuho, frustrated with his failure confronted Koro-sensei with an almost impossible situation. During the confrontation, the similarities between both teachers were revealed; their love of education and their early experiences in the field. In order to maintain the trust of his students, Koro-sensei told the story of his origin, how he gained his powers, why he had chosen to be the teacher to Class E, the story behind the destruction of the moon and the reason the deadline of his assassination. The story deeply affected everybody in the class and made the final confrontation extremely emotional. I had intended to only watch the first part and the last part of the second season but was drawn into the story and watched all the episodes. Arima, Kousei is protagonist who was known as the human metronome because of his piano playing ability at a very young age. He was unable to hear his own music soon after his mother passed away. He has given up playing the piano but held on through his assignments in school. As far as he is concern, he has no other skills other than playing piano but he has lost that due to his disability. As the story progress we are given a glimpse of his tortured childhood where he is forced to play piano and nothing else. He started taking up piano again after much pestering from Kaori Miyazono. 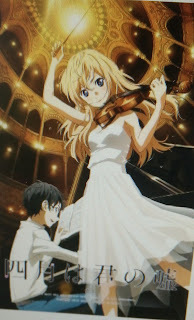 Miyazono, Kaori is a free-spirited violinist introduced to Kousei Arima by his childhood friend in what was to be a double date Tsubaki was to introduce her to another friend Watari. However, the first meeting did not start well when Kaori mistook Kousei as a pervert. Her style of play went against what the judges were looking for in her first competition but she did not care as long as those who heard her would be moved and would remember her. It is later in the story that we see that she had an ulterior motive, to get Kousei to play again. She was moved by Kousei first public performance and had set a goal to get her idol back into music but her time was limited. Sawabe, Tsubaki is Kousei neighbor from childhood. He always declined her request to play because he had to practice piano. Together with Ryouta Watari, the three of them were close friends. 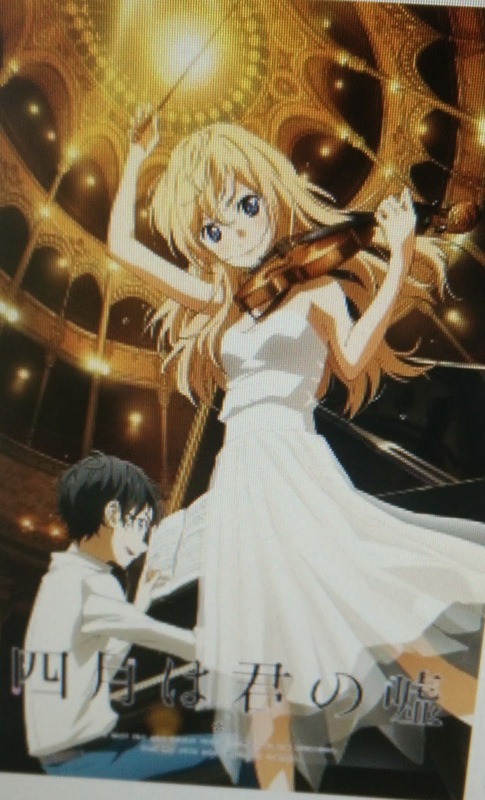 She treated Kousei as her dumb big brother and hated music because she did not understand it and felt that music kept taking Kousei away from her. She is more physical and is the captain for the baseball team in their school. Watari, Ryouta is close friend to both Kousei and Tsubaki and is the boyfriend to Kaori. Even though Kaori is his girlfriend but it looks like Kousei spends more time with Kaori because Watari is busy with his duty as the captain of the soccer team in school. Seto, Hiroko is a close friend to Kaori’s mother. She is famous pianist and feels guilty for the Kaori’s suffering because she is the one who suggested to Kaori’s mother to make him a pianist. She returned to Kaori’s life after Kaori made the first appearance in a piano competition. Igawa, Emi a capable but emotional pianist. She was the main competitor to Kaori. Takeshi was inspired to compete after seeing both of them in a competition. She has a goal to surpass Kaori. Aiza, Takeshi is a very capable pianist with the sole goal of surpassing Kaori. Takeshi, Emi and Kaori were always in the top three in all the competitions they participated in but the top prize always went to Kaori. Kaori was always unreachable because he left immediately after each competition without waiting for the results. Takeshi considered Kaori his hero. Aiza, Nagi is Takeshi’s sister and idolizes his brother. She asked Hiroko to teach her how to play piano but was assigned to Kaori instead. The training paid off when she successfully played a duet with Kaori in which Kaori challenged her while she managed to keep up. There are a few other support characters like Koharu Seto and Nao Kashiwagi. I liked how the stories developed between the episodes as well the connection between the characters and in the end the love of mother and child and how this was not communicated (and in the end misunderstood). Imagine being in high school and believing that everyone hates you - that is what Handa Kun believes and as a result he has creates a wall between him and everybody else in school. Due to his paranoia, he was unapproachable and those around him mistakes his actions and get the wrong impression about him. The story takes us through his experience and how those who felt threatened by him ended up becoming his fan. As his fan base grew, our hero is totally unaware and just see more and more threats. All these events makes for a very funny anime. When one of the girls in his class tried to confess to him, he thought the letter was a chain letter like the ones he used to get and refused to read it. When he threw the letter away without reading it, another classmate (the best friend to the girl who wrote the letter) scolded him and then pushed the girl to confess to him. Instead of confessing, she asked him to see him after class in the gym. He thought the girl was calling him out for a confrontation. His attempt to pass a message to avoid the confrontation resulted in both girls competing for him. In another episode, he was sent to get a truant from his class to return to school. The truant was bullied previously and had dropped out from school and bulked up to avoid being picked on. After that, the truant decided that he did not need school anymore and decided to be the neighborhood protector. Handa actions during their first meeting convinced the truant that he is much stronger than him (not really true) and pledged to be his protector. When people do not know the facts, their imagination will create stories that are often bigger than life. Our unproven beliefs can enslave us and make us suffer unnecessarily. Imagination can make people act irrationally. There is a lot of lessons to be learned from this anime. I feel a bit guilty laughing at the suffering of the protagonist. 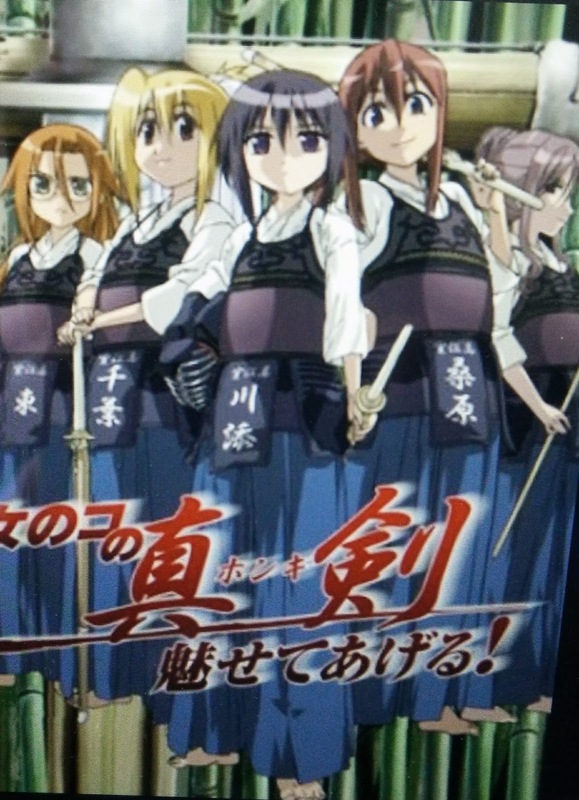 I recently watch this anime that was in Mandarin with English subtitle. The story revolves between a girl and two brothers. She met him while crossing the road without looking. He knocked her down and caused him to lose the food he was delivering. This chance encounter explains why she calls him and why he calls her stupid girl. The anime consist of 24 episodes. 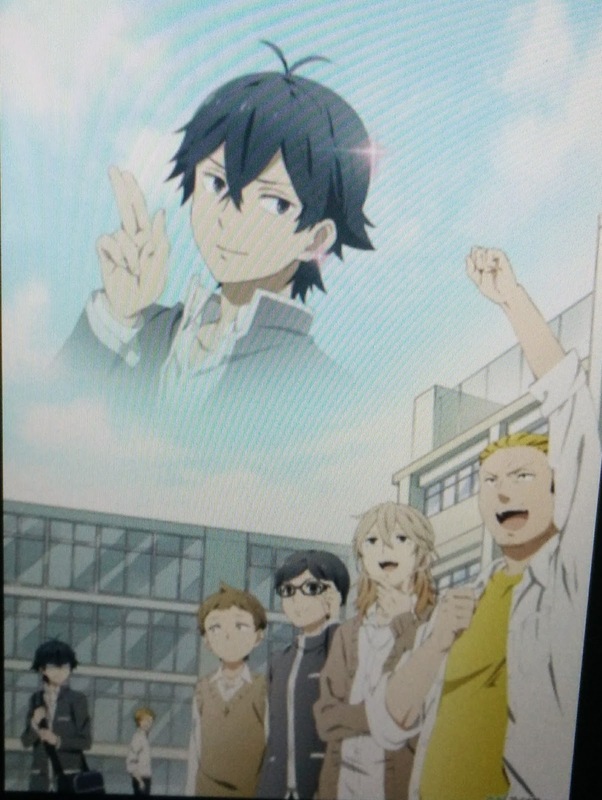 The development was good, the first episode focus on her looking for a job as a fresh graduate at a job fair (where thousand of others are doing the same thing). Later she receives a text to attend an interview at night. While walking towards the interview, she looked around and realized that the building looked spooky. She then started thinking of why a company would call her for an interview so late in the night - human traffickers or organ traders. By then she was lost in Rakshasa Street filled with demon soldiers. Turns out that she is in a place for the dead and humans are forbidden there. I enjoyed the story. It turns out the girl was special with a guardian in her and an organization was trying to capture her. The big brother is the Requiem General and protects the area with his brother. It is later, we get see the story of the two brothers, from the time their parents had to leave them to fend for themselves. There is a twist in the story on who is the elder brother and who is the younger. When the parents left them, one of them was still a baby and the other was only about five to six years old. 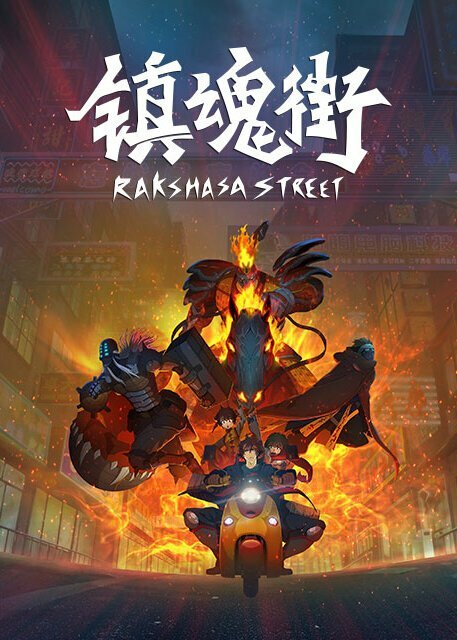 Despite all the hardship, the eldest boy was determined to keep his promise to his father - protect his brother and protect Rakshasa Street. A mute girl who selflessly protected the child against the advice of other residents. A new General drunk with power causing suffering of those in the village. The love-hate relationship between the two brothers. This was a great anime and I think the live version of this anime is expected in 2017.